BMW bets awd 3-series sedan will help top Mercedes in U.S.
BMW says the xDrive awd system will be available for the new BMW 3-series sedan, pictured, from the third quarter of 2012. DETROIT (Bloomberg) -- BMW is betting a new all-wheel drive variant of its 3-series sedan, due for release in the third quarter, will help catch a resurgent Mercedes that has outsold BMW all year long in the U.S. market. The annual race between the premium brands BMW, Mercedes-Benz and Lexus in the United States has become more important than ever. A slowing economy in China and a five-year slump in Europe have raised the stakes in the United States, where premium cars continue to sell briskly. "North America is the only bright spot, and in the luxury race that's shaping up to be really important," said Michelle Krebs, an analyst with researcher Edmunds.com. "It's vital for the German automakers because their home market of Europe is a mess." Both the Mercedes and BMW brands are thriving in the United States, but BMW is determined to do better after trailing Mercedes this year even though it introduced a redesign of its popular 3 series in February. The early-year stumble may have been the result of offering the marque's top-selling model without a four-wheel drive version, popular in cold-winter markets such as New York and Boston that are full of luxury-car buyers. "We were lacking cars for three or four months, now we are fueling up," Ludwig Willisch, head of BMW's U.S. operations, said last week in an interview from the automaker's offices in Woodcliff Lake, New Jersey. Mercedes' introduction last year of an updated C-class compact sedan and new coupe version has helped U.S. sales rise 14 percent to 168,462 this year through August from a year earlier. That puts Mercedes more than 3,800 deliveries ahead of BMW, which boosted sales 5.6 percent to 164,636 for the same period. Industrywide deliveries increased 15 percent through August, according to researcher Autodata Corp. The luxury-vehicle fight in 2012 looks to be close like last year when BMW beat Mercedes by 2,715 deliveries, excluding Daimler's cargo vans and Smart cars and BMW's Mini brand, which aren't luxury vehicles. "It will go right down to the wire again," Tom Libby, an analyst at R.L. Polk & Co., said in a telephone interview. Lexus is probably too far behind to catch up in the year's remaining months, analysts have said. That leaves the race mainly to the German luxury carmakers. In February, Willisch said he expected sales of the new 3 series, last redesigned in 2005, to expand more than 10 percent. So far this year, total U.S. sales of the 3-series line, including old versions of the coupe and wagon models, slipped 1.1 percent to 60,621 while deliveries of the new sedan rose 3.8 percent to 43,053, according to Autodata. 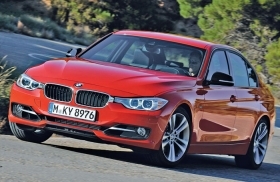 BMW has continued to sell the all-wheel drive version of the old 3 series while waiting on the redesigned model. Sales of Mercedes' C class, meanwhile, rose 27 percent to 49,868, boosted by 5,969 deliveries of the sportier two-door version. "We're taking the fight to them," Steve Cannon, head of Mercedes' U.S. operations, said last week in an interview in New York. "We've got a nice, strong plan for the rest of the year." Mercedes should also see a boost in sales during the final months of the year as a redesigned seven-seat GL-class SUV and an updated GLK, its smallest sport-utility, reach dealer lots. "It's going to be full-court to the end of the year," Cannon said. He added that he doesn't know if Mercedes will top BMW this year, citing the fluctuations in his competitor's sales and introduction of the X1. Now that BMW has ramped up 3-series production and is bringing out the all-wheel drive version, sales should surge and make BMW the top-seller for the year, Willisch said. "What counts is that we are in the No. 1 position New Year's Day and we plan to do that by a healthy margin," he said. The 3 series, which was first introduced in 1975, is one of the most profitable vehicle lines of all time, Max Warburton, a London-based analyst at Sanford C. Bernstein, has said. It has generated $290 billion in revenue and $17 billion in earnings before interest and taxes since 1995, he estimated. The importance of all-wheel drive as an option for luxury cars began as consumers moved out of four-wheel drive SUVs and into sedans and coupes and as they put greater emphasis on safety features, Libby said. "The move of customers in the direction of safety has propelled the manufacturers to offer it more," he said. "A manufacturer that does not offer it is in trouble." About half of the 3-series sedans sold in the United States are all-wheel drive, BMW said. In the northeast, for example, it's 80 percent. For many customers, the all-wheel drive option has become as much a requirement as an automatic transmission, Willisch said. "It really is something that they definitely want to have and they don't want to compromise on," he said. BMW's sales will also be lifted in the United States by the addition of the X1, which is classified as a car while looking like an SUV. It's based on the same frame as the previous generation 3 series. The X1, a step below BMW's X3 midsize sport-utility vehicle, is the brand's lowest-priced model in the United States, starting at $30,650. BMW expects to sell more than 20,000 X1s in the U.S. next year, Willisch said. Others aren't as optimistic. IHS Automotive estimates BMW will sell 3,000 this year and 13,000 to 14,000 next year, according to Rebecca Lindland, an analyst for the researcher. BMW faces pressure from Mercedes in the United States as it also sees increased competition from Volkswagen AG's Audi brand in other markets. BMW, the world's best-selling luxury brand, saw its global lead narrow to 2,110 over Audi after August sales, the companies' reported numbers show. Last year, BMW brand sold 1.38 million cars and SUVs. Audi sold 1.3 million units, while the Mercedes brand sold 1.26 million vehicles.